If you open both savings and chequing accounts with Tangerine, you will get $50 welcome bonus (you can use our referral code: 47651893S1 in order to get $50) with just at least $100 of initial deposit (into either account), and by April 28, you can get a chance to get another $75 if you set your payroll with Tangerine. 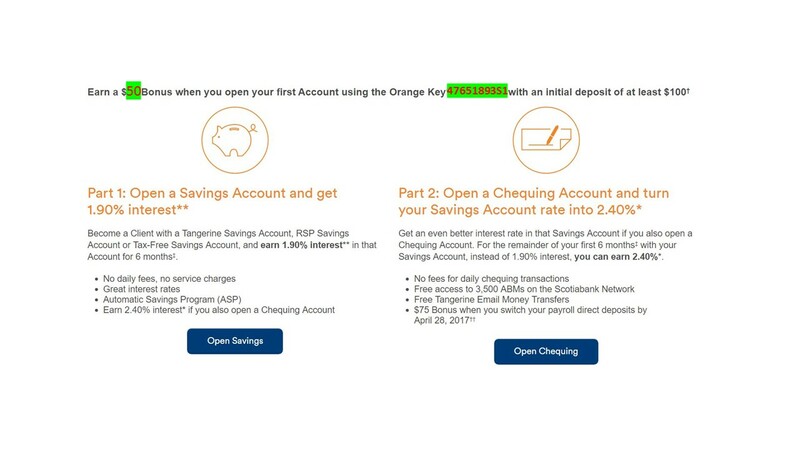 Note that you can use Great Canadian Rebates link to go to Tangerine website, so that you can earn an extra 25 dollars: register throughhttps://www.greatcanadianrebates.ca/register/203630/ and input referee email: qingyangliurick@gmail.com so you and I both will get 2.5 dollars. 1. Complimentary 50 pages of cheque for each account holder. 2. Free Email money transfer. 3. No service charge and daily fees.